This post was written during the great health care debate in our nation. This debate reached a milestone in the passage by the House of Representatives of the recent healthcare bill. In our humble little Foodland Chronicles, we encourage supporters and opponents alike to refine their positions and listen and learn from the other side. We are hopeful that compromises can be reached, benefits to public health achieved, and risks minimized. But these hopes are tempered by our perception that the bill really does not deal with the root causes of the problem. In these blog posts we are trying to describe how food and exercise, in a style of eating we call the “Mediterranean-style” are among the most important things that individuals can do to help themselves and their own families become and stay more healthy. The cost of what and how we eat and the costs of health care are obviously linked. As individuals our votes and political activities matter, but what is far more under our personal control is to concentrate on what we can do individually for our family’s health and health care. 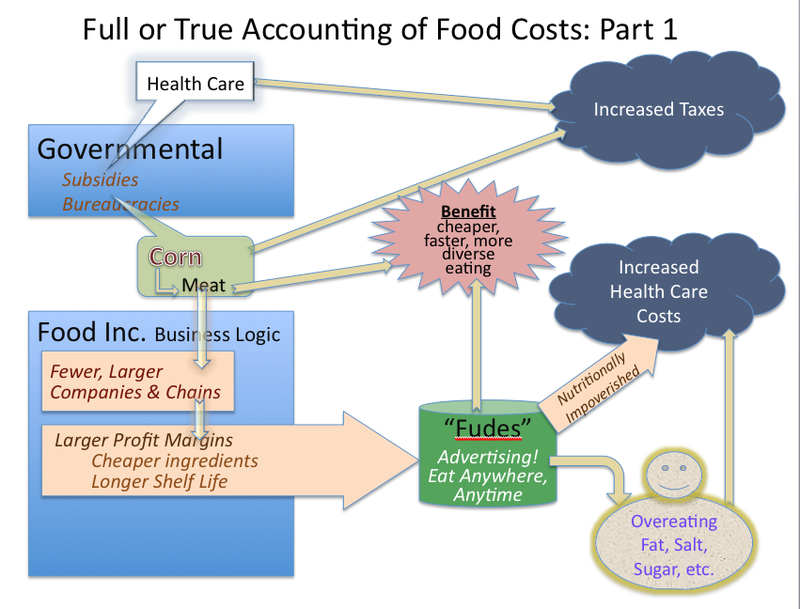 To help explain our point of view on the fundamental issues, I created the graphic below to try to explain part of what economists are calling full, or true cost accounting. It is a method that assesses not just immediate cost advantages, but future outlays and long-term costs and benefits as well. Joyce, Doctor Grandma, is trying to encourage you to put different foods on your table, and make them yummy. She is suggesting how you will reap the benefits of healthier, happier lives and lower health care costs. The meals she suggests might actually cost less in both the short run and the long run, (see Budget Friendly Homemade Soup). But if you compare the cost of a Doctor Grandma’s whole-grain pancake mix and its high quality olive oil against a refined white flour pancake mix with no oil, there is a big difference in cost at the checkout counter. Full cost accounting gives a more complete picture. In this blog post (Part 1), I will introduce only briefly the terms and concepts of this graphic. Evidence in support of the relationships in this model has been given in past posts, and will be expanded in future posts. This graphic depicts a cause and effect model. Two blue boxes, representing government and industry have launched forces which lead to an important benefit, depicted by the red starburst: Seemingly cheaper faster, and more diverse eating. (Doctor Grandma disputes that the apparent diversity of fudes is real. She argues that the seeming diversity hides a deep underlying sameness.) Aside from how valuable the starburst of benefits actually is, there are real costs and social problems associated with the government’s and the food industry’s contributions. The two problems in Part 1 are both depicted as dark clouds: Increased Taxes, and Increased Health Care Costs. Health care costs keep rising, and the government tries to meet this challenge by subsidizing health care in more and more ways through taxes. The cause and effect chain is direct leading from subsidies and bureaucracies to the first black cloud, higher taxes. Bureaucracies are set up in both the health care and food industries. We taxpayers foot the bill. The causes leading to increased health care costs are more indirect. The chain of influences goes through government-subsidized foods, of which corn and meat are the two most significant. Corn is an unusually productive calorie-producing plant. Like other grains, it is of the grass family, but it produces more new kernels per kernel of seed corn than do other grains. Government subsidies and industrial farming methods have led to corn surpluses, and low costs. Corn can be used for MANY profitable products. Cheaper meat is one of the most important of these in influencing health costs. The arrow from Corn to Meat depicts the influence subsidized corn has had in producing cheaper meat much more quickly – true for corn-fed cattle, hogs, chicken, and even farmed fish. The arrow from the light green box representing subsidized corn and meat goes directly to the benefit of cheaper eating, and also indirectly, through the fewer, larger companies and restaurant and grocery store chains of Food Inc. In particular, it goes to the production of highly processed substitutes for whole foods, depicted by the green “can” and named “Fude” to distinguish it from whole foods that have constituted the diet of our species for millennia. Fudes are different from the foods humans were eating long before the advent of the large, industrial food companies. (“Food Inc.”,“Fude” and other terms are defined below). Fude, and the distribution and marketing infrastructures that Food Inc. has set up to increase the volume of fudes sold, has made fudes widely available. The Food Industry has accomplished this feat in a variety of ways. A key one is by removing the perishable ingredients, then using a lot of salt, sugar, and deep frying in long-lasting fats (highly saturated and trans-fats). The use of these three cheap ingredients helps to preserve the fudes, and also substitutes other forms of palatability for the good tastes of perishable ingredients lost in processing. Along with innovations in packaging, the fudes have a very long shelf life and can be made available anywhere, anytime. Fudes are often portable and everywhere available to tempt the palettes of those who have learned to eat them and to like them. Fudes have excellent profit margins, due particularly to the subsidies, the longer shelf life, and greater volumes sold. These profit margins can be tapped to advertise the fudes widely. Extensive advertising helps greatly in the process of converting people to fudes instead of the foods our ancestors were evolved to eat. The wide variety of fudes, and their design to be pleasing to the palette through the use of layers of fat, sugar, and salt, is essential to the star-burst of benefit. More fudes; fudes that people like to eat, fudes that people learn to consume not just at meals, but anytime, and develop a craving for and therefore eat over and beyond the calories their bodies need; fudes that may be had at relatively low costs at the check-out counter. But the checkout counter costs do not come close to accounting for the true costs. The chain of cause and effect reaches its most telling and most understandable point in the icon of the obese person, over-eating a diet of fudes containing an excess of unhealthy ingredients: saturated fats to clog the arteries, a great excess of salt to increase high blood pressure, a super-abundance of sugar, giving the over-eaters a large number of empty calories (an empty calorie just produces energy, if energy is not needed at the time, the calories get stored as fat; empty calories do not contain needed vitamins, minerals, fiber, etc.). While taking out the perishable nutrients makes possible a greatly extended shelf life, the fudes are nutritionally impoverished, (see the fat arrow from the fudes icon). Vitamin additives may replace some, but only a small fraction of what has been processed out. This has a general negative effect on health care costs, but the greater effect is understood when the chain of arrows passes through the icon of the overeating person. This icon represents the millions of people who are taking in excess of everywhere available fudes, and with it, the excess of fat, salt, and sugar. While fudes taste good and can be brought to us at competitive prices, they are lacking a multitude of important, healthy ingredients. These were removed both to create different, “more refined” tastes, but also, and very importantly, because they were perishable and reduced profit margins. Fude: Highly processed substances sold in packages for immediate consumption or quick preparation; also highly processed and designed dishes served in restaurants. In packages, perishable ingredients have been taken out or minimized, and mixed with excesses of salt, fat, and sugar in amounts not found in traditional whole foods. (See Kessler, The End of Overeating: Taking Control of the Insatiable American Appetite . Hyper-palatability is sought through food hedonics research that emphasizes these three ingredients. Fudes contain many additives to “preserve freshness”, add color, add flavor and texture, or to insert commercially convenient forms of vitamins and minerals. In restaurants, higher profit margins, the most telling aspect of fudes, is accomplished using preprocessing and streamlined cooking to minimize preparation time and labor costs. Subsidies for foods. Government creates subsidies for certain foods, paid from tax revenues. Corn and meat subsidies have been central to lower costs for these farm products. One form of subsidy goes to government itself to set up bureaucracies to pay for part of the work (e.g, meat inspections). This subsidy benefits some companies in the food industry by reducing their costs further. Other subsides help the food industry directly by purchasing surplus output. Other subsidies are paid directly to farmers. This is also of great benefit to the food industry because it makes the raw ingredients from the farm much cheaper, and leads to overproduction. It benefits farmers by enabling them to survive when it costs them more to produce farm products than the market will support, but at the cost of distorting the market. Subsidies for health care. There are many varieties. They are basically paid by tax revenues. Some help big Pharma in a manner similar to the way corn subsidies to the farmers benefits Food Inc. Big Pharma, doctors and hospitals get the benefit of payments to individuals through government subsidized insurance plans. Medicare has been the largest subsidized plan. Now the new government health plan will add millions of additional people to a government subsidized plan. Pricing mechanisms set by the resulting bureaucracies obscure competition and make it difficult to drive down prices. Miss-pricing by bureaucrats in both government and insurance plans leads increasing numbers of doctors to pull out of or limit treating Medicare patients. Food, Inc. , the Academy Award nominated documentary, and in an accompanying book . It refers to the industrialization of the entire food chain, and generally, to any of the big industrialized food businesses. Food Inc. seeks to give the public the benefit of cheaper faster, seductive eating, and give it to them anywhere, anyplace. The links reference investigative journalism into the increasing power of Food Inc. over the entire food chain, its apparent immunity from challenges, and its social costs. Food Hedonics Research – In psychology ‘hedonics’ is “the ethical study of pleasure.” When hedonics is studied as the science of creating and manipulating sensations associated with eating foods the “ethical” part is seldom if ever remembered. The development of foods that will grab you and won’t let go of you is about increasing sales and attaining high profits. Business Ethics, The contested status of this term is explored in the link to Wikipedia. The article states that “…economist Milton Friedman held that corporations are amoral and CEOs have only one duty: to maximize the profits of a company.” Other thinkers look more broadly, as in this blog. But in practice, it seems that the big food companies maximize profits then react when problems arise. If there are social costs to be paid along the way, the companies will try to manage these costs and keep them as low as possible. The government facilitates this corporate behavior by subsidizing partial solutions attainable through the political process. This helps the companies treat these social costs as side issues, arguably not their concern. But more companies are trying to introduce product changes, or sponsor socially desirable research and programs. Those that do so should be encouraged. This graphic does not tell the entire story of health costs. Certainly nicotine and other addictions, air and water pollution, automobiles and accidents increase health and related costs. But this blog is about food and about how we can take greater control of our style of eating. In these blog posts as a whole, Dr. Grandma has presented substantial evidence that there are real connections as illustrated in this little graphic. Certain kinds of eating lead to a great reduction in the big scourges of our time; chronic conditions like type II diabetes, obesity, cardiovascular disease, and the cravings for certain unhealthy foods that lead to these conditions. Dr. Grandma has cited study after study about the effects of the different aspects of the Mediterranean-style of eating on improving these chronic conditions. In my next guest blog post, Part 2, I will consider the effects of the ingredients that Food Inc. has found work so marvelously in the most profitable fudes. This post will also consider how food hedonics research, and unexpected effects of fudes our bodies were not evolved to handle, may be more central to the problem of the over-eating obese “everyman” in the lower right corner of the graphic than has been realized. But new evidence is bringing these hidden effects of fudes to light. Thanks for your kind comments. This blog post was written in April, 2010 and has continued to be found and referenced. I know these concepts are important, and hope in the future to find other more effective ways to get them out. Perhaps you can help, in your own circle of influence. Good day! I could have sworn I’ve been to this site before but after looking at a few of the posts I realized it’s new to me. Any way I will be subscribing on your feeds or even I success you access persistently rapidly. Should We Put the Brakes on Eating Cheese?